PORT ST. LUCIE, Fla.—The future face of the Mets holds no illusions about invincibility. 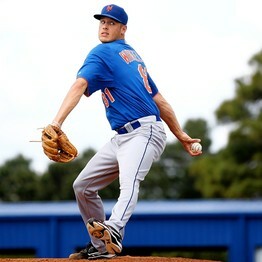 Eight years ago, Zack Wheeler’s older brother, Adam, was a hard-throwing Yankees pitching prospect. A torn labrum sapped him of his strength, ending his career at age 21. Today, he works as a carpenter. That is, unless the Mets can prevent it. Wheeler’s quest to avoid the fate of his brother is indicative of what is perhaps the most important aspect of this season for the Mets: the development of their young arms. It will happen far from Citi Field, in minor-league stadiums from here to Buffalo. But it is arguably more significant than anything that will occur at the major-league level. The Mets have three highly regarded pitching prospects in Wheeler, Matt Harvey, and Jeurys Familia. The team’s plan to become something more than New York’s favorite punching bag hinges on at least one or two of them emerging as stars. To do so, they must avoid becoming the latest additions to baseball’s vast graveyard of pitchers whose dreams were dashed by torn muscles, tendons and ligaments.